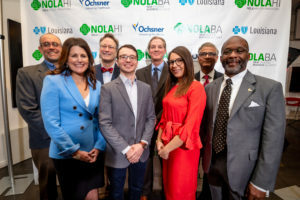 The New Orleans Business Alliance, Blue Cross and Blue Shield of Louisiana and Ochsner Health System today announced that the portal to apply for the 2019 New Orleans Health Innovators Challenges is now open. The Health Innovators Challenge is a nationwide call for digital health startups to offer solutions to leading healthcare problems. Applicants compete to win cash prizes, opportunities to pilot their programs in some of the region’s largest medical institutions and in-kind donations. Whether working in the BioInnovation District, taking advantage of tax incentives or participating in one of the numerous startup accelerators, New Orleans offers many opportunities for startups. “New Orleans is widely recognized as America’s newest hub for creative entrepreneurs and innovators. With local corporations worth billions of dollars seeking investments in promising digital health companies, the New Orleans Health Innovators Challenge is an incredible opportunity for small businesses to land huge clients and the kind of partners that lead to success,” said Quentin Messer, Jr., president & CEO of the New Orleans Business Alliance. This year, Blue Cross and Ochsner present the Social Determinants Data Challenge. “We know things like diet and exercise affect our overall health, but other social determinants can lead to disparities, too. Things like socioeconomic status, living alone, or lacking access to transportation affect health, and we have a real opportunity to improve outcomes if we address these,” explained Dr. Vindell Washington, Blue Cross chief medical officer. Louisiana Healthcare Leaders announce launch of the New Orleans Health Innovators Challenge. “We’re seeking digital solutions that will help us have a more complete picture of health needs of the individuals we serve. With more information about social determinants, we can work with patients and other stakeholders to provide proactive, preventative and personalized care, address health disparities and improve health outcomes,” added Aimee Quirk, innovationOchsner CEO. Startups can view and apply to additional challenges sponsored by New Orleans Health Department, Tulane Health System and Lafayette General Foundation. The application deadline is Jan. 13, 2019. The New Orleans Health Innovators Challenge was created in 2017 by the New Orleans Business Alliance, Blue Cross and Blue Shield of Louisiana and Ochsner Health System to drive healthcare innovation and investment in New Orleans by creating a community where doctors, patients, nurses, hospital leaders, scientists, designers and leaders from partner organizations can come together to collaborate, connect and co-create the future of medicine for New Orleans and beyond.